I’ve always loved the retro rock infused sound of The B-52s. It seems whenever they tour I only find out about it after the show has left my area. So, I’ve never had the pleasure of seeing this band live. This live recording lets me experience some of that. It’s also convinced me even more that I want to see these guys live. This rocks out extremely well. It’s still got a lot of that B-52s magic, but is one of their hardest rocking tunes. Always one of my favorites from the group, this has all the power, but some of the magic seems lost in the live version. Still, even with a little less of that B-52s magic, it still rocks. The later sections work better than the opening movements, too. While “Mesopotamia” isn’t one of my favorite songs from the band, the expansive jam section on this one works really well and if it’s the B-52s it has to be fun. I wasn’t familiar with this song until I heard it here. It’s a good cut that has all the trademark B-52 elements. It’s a great live jam. I’ve never been overly crazy about this tune. The live version, though, seems stronger than the studio rendition. Here’s another with which I’m not familiar. It’s very much classic B-52s in style, though. If there’s one album from the B-52s I never liked, it’s the one that produced this tune, Whammy. It works OK here in this live rendition, but it’s still not a favorite of mine. One of the group’s biggest hits gets the live treatment here. There’s a real rocking motif here. While it loses a little something from the studio rendition in terms of magical atmosphere, it more than makes up for it with the rocking sounds. Here’s a very old B-52s song. It’s got that retro rock texture and works quite well. This feels very much like the studio version. In fact, they really nailed the arrangement on this. 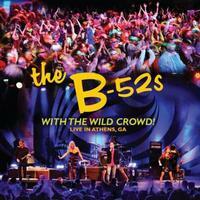 Here’s another classic older B-52s number. They manage to expand on this, while still nailing it. It’s so much fun. Another tune that’s new to me, this one has a real retro rock sound to it. The vocal arrangement is intriguing, but I’m not blown away by this one. A title track, this rocker works exceptionally well in the live take. It’s never been one of my favorites from the group, but I like this one better than the studio version. I don’t remember hearing this one before. It rocks out pretty hard in a lot of ways. It’s got a classic B-52s feeling to it. It’s a cool tune. This is literally just a short introduction of the band. The band’s best known tune, it’s a party tune. The arrangement seems a bit stripped back with a real focus on the funky guitar-line. I’m not sure I like this rendition as much as the studio version. It’s fun either way, though. Starting with keyboards, I don’t remember this song. It’s kind of a weird one. Of course, that label takes on some real significance when you remember this is The B-52s. It’s fun, though and gets better as it continues. This classic B-52s tune was always one of my favorites from the group. They put in a killer performance here that rivals the original. The first track I (and probably a lot of people) ever heard from The B-52s, I’ve always loved this one, too. It’s got such a great retro sound and is so much fun. This live recording works extremely well.